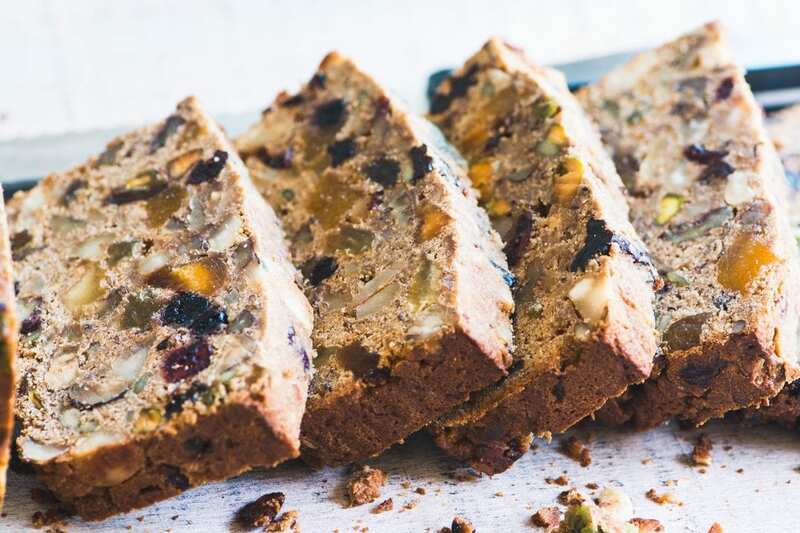 Paleo Fruit and Nut Breakfast Bread ~ this amazing chunky quick bread is grain free, and dairy free, with no added sugar. 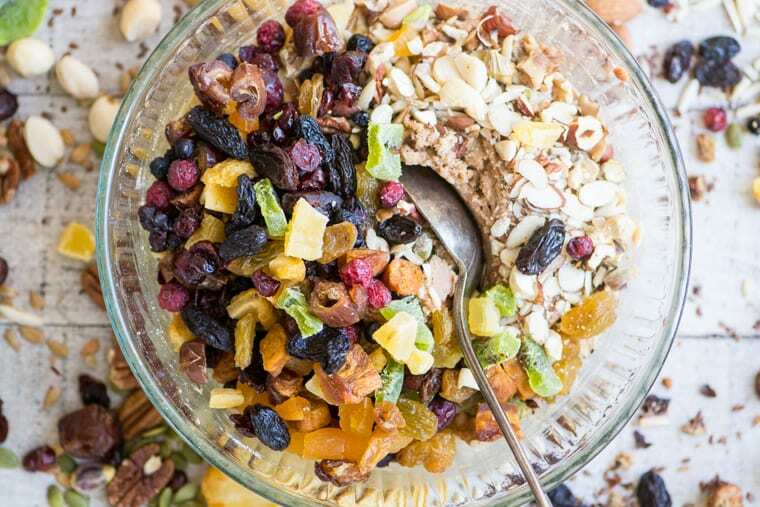 It’s also an ingenious way to use up all the random dried fruit and nuts in your cupboards. This bread never ceases to amaze me ~ the base ingredients are so simple, just a couple of eggs, coconut oil, a little mashed fruit, and some almond flour. 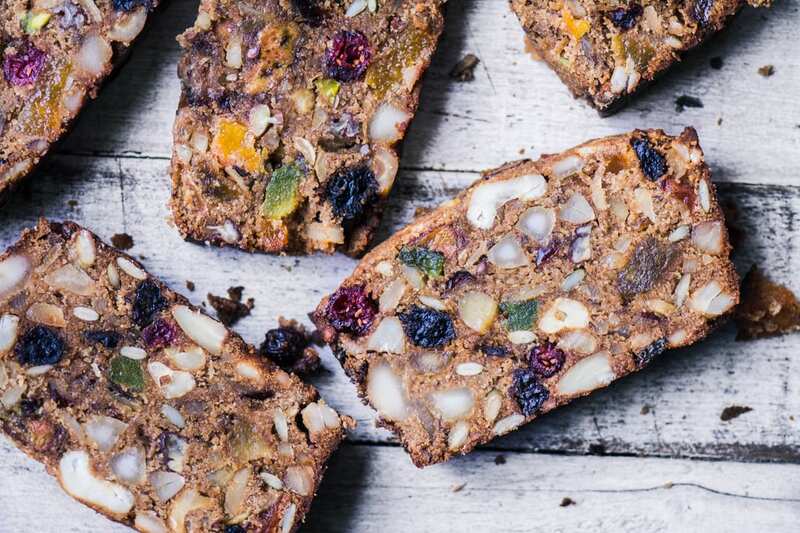 A kaleidoscopic array of dried fruits, nuts, and seeds give this bread incredible flavor and texture, and makes every single slice an adventure. I dare you to be hungry after a enjoying a piece of this jam packed bread. 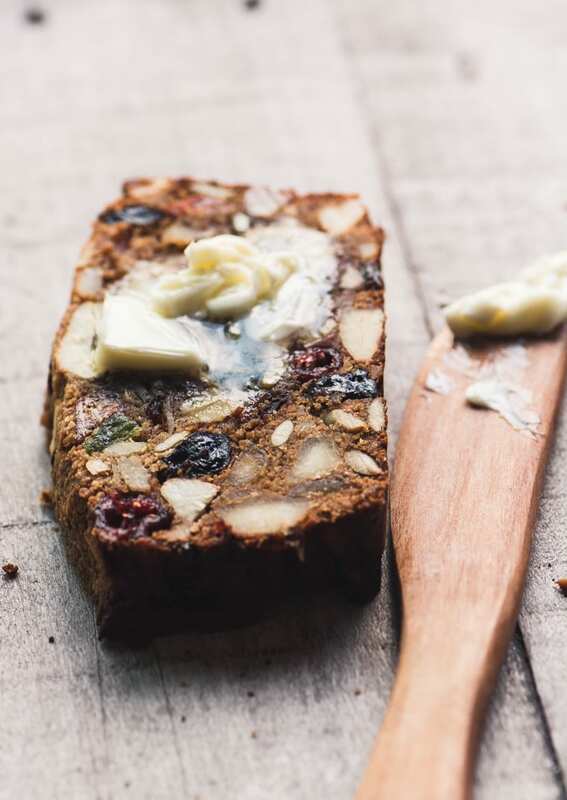 This bread is patterned after my PALEO FRUIT AND NUT BREAD, a reader favorite. Lots of you have told me how much you love it, and about all the ways you’ve adapted it to make it your own. The original recipe uses mashed bananas, but here I’ve substituted apple butter. This is a very delicate bread because there are no grains in the recipe to hold it together like a traditional bread. I recommend wrapping the still warm bread in plastic and refrigerating overnight, before slicing with a good serrated bread knife. When you add the 4 cups of fruits and nuts to your mixing bowl you’re going to swear it will never work, and you might even be tempted to curse me after the first couple of stirs…but persevere! A few good rounds with a big spoon and it will all come together. Use clean hands if you like. 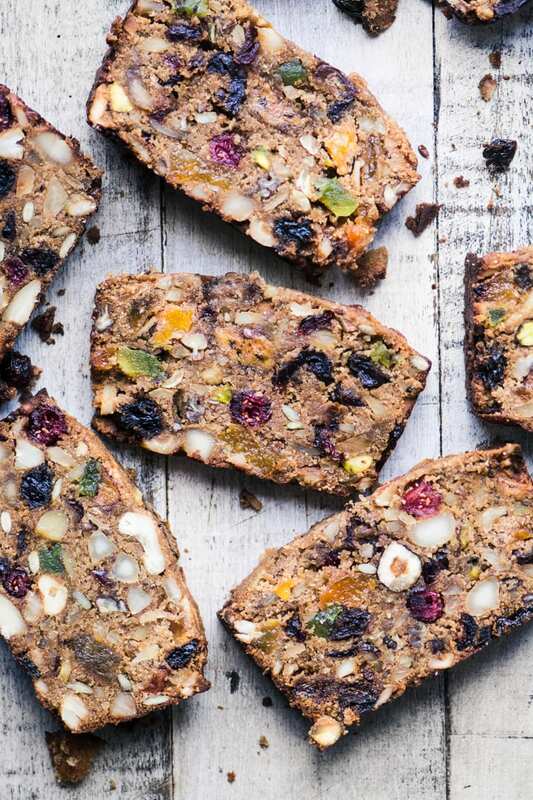 TIP: The key to the pretty mosaic effect in the bread is to use a good assortment of fruits and nuts. 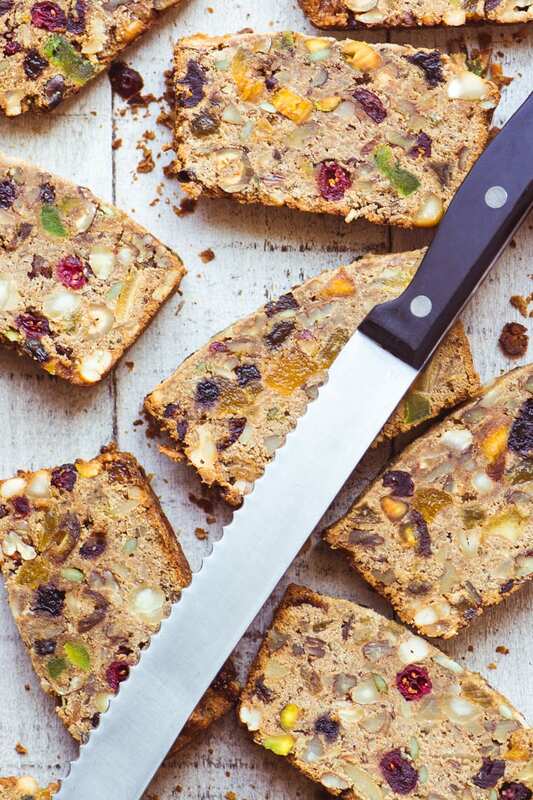 Cranberries, pineapple, golden raisins, kiwi, pistachios and apricots give it a nice pop of color. Remember the rising is minimal with this bread, so what you see in the loaf pan is what you’ll get after baking. Make sure to get the dough fully into the corners of the pan, and I like to smooth out the top with an offset spatula. 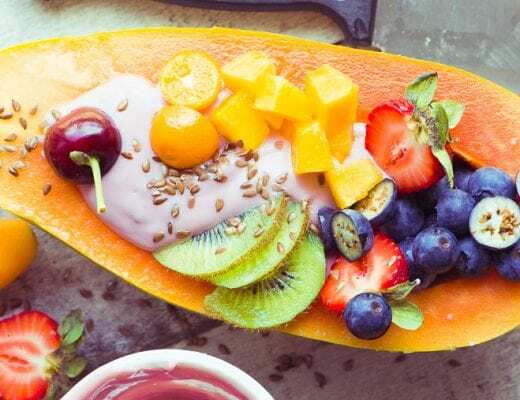 The Paleo Diet is a diet based on the idea that we humans have evolved to eat a certain type of diet, the kind of food that our caveman/woman ancestors ate as hunters and gatherers. Here is an easy visual guide to explain the basics. While I don’t personally follow this diet, I enjoyed the challenge of coming up with this bread recipe that fits Paleo guidelines. The texture of this bread is dense, but it will also be moist. It really comes alive when you toast it, but it can be too delicate to withstand a regular toaster. A toaster oven is ideal. TIP: You can freeze this bread, well wrapped. TIP: If you aren’t on a Paleo diet you can give this bread more structure by adding a cup of oat flour in place of some of the almond flour. In that case it will still be gluten free. Spray a standard loaf pan with cooking spray and line with a sheet of parchment paper with long ends. This is so you can easily lift the bread out of the pan. In a large bowl whisk the eggs, coconut oil, and apple butter. Stir in the flour, baking powder, and salt. 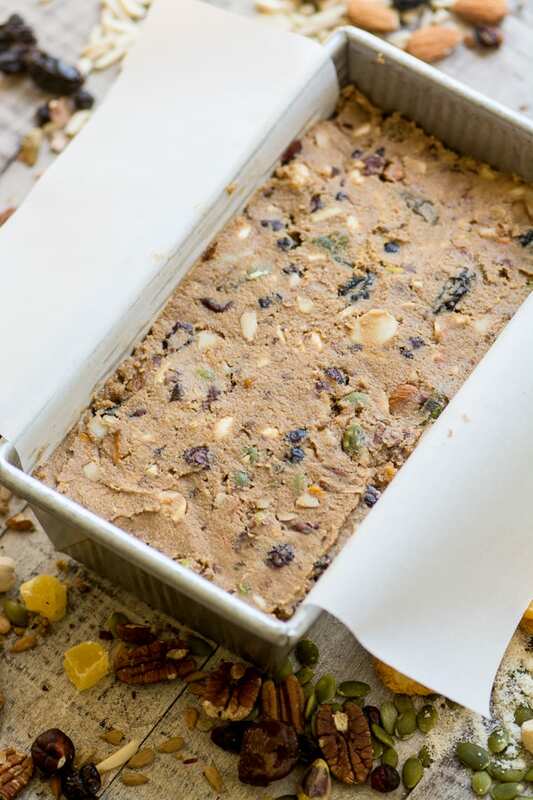 Fold in the fruits and nuts, and mix until everything is well combined. Turn the batter into the prepared pan. Smooth out the top. Lay a piece of foil loosely over the top of the pan to prevent too much browning and bake for an hour, or until the top looks dry and is just beginning to crack, and a toothpick inserted in the center comes out dry. I usually remove the foil for the last 10 minutes of cooking. Cool for 15 minutes, then lift the bread out carefully with the parchment paper 'wings' to cool on a rack. Wrap in plastic and refrigerate overnight. Then slice with a sharp serrated bread knife. Trader Joe’s sells a hazelnut flour (or meal) that will work in this paleo bread. I didn’t add anything in the way of flavorings, but you could use some vanilla or almond extract, or some warm Fall spices. I plan to try pumpkin puree in place of the apple butter next time. 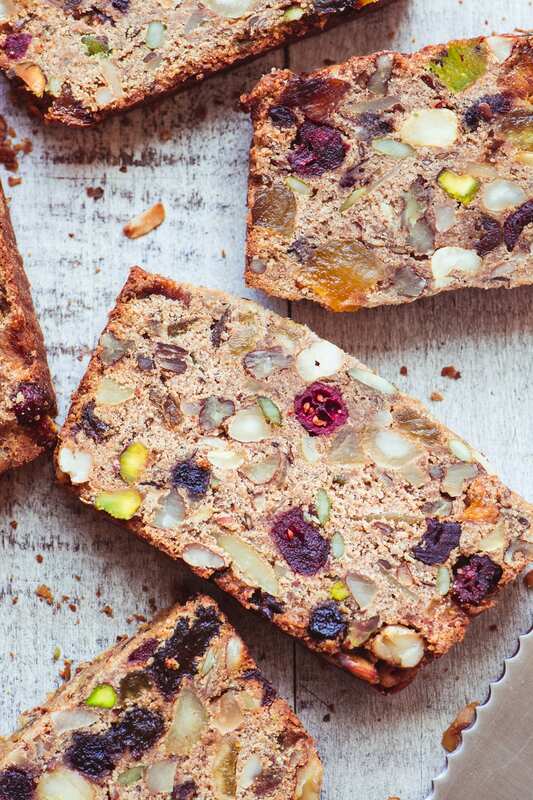 Don’t forget to pin this paleo fruit and nut breakfast bread! What is apple butter please. Apple butter is a smooth very thick apple spread, made by cooking the apples, pureeing them, and then cooking down again until it gets thick. It’s really delish! You can buy it in stores usually in the peanut butter or jam section. You can also make it yourself. You can used mashed banana in its place if you like. Also, I have always followed your suggestion of wrapping and refrigerating overnight, and it slices perfectly. Come to think of it, its my favourite too! Yum. Hi Sue. I just baked the bread, and it looks amazing! Can you freeze the bread? Thanks. Cooked this today…it taste really good ,thank you for sharing your recipe. I have made this loaf 4 times, each a little different. I love it. 1 thick slice does me for breakfast. Have you tried it with pumpkin purée yet? Apple butter is so expensive that I’m making my own without sugar. It is soooo good, even the baby likes it. This sounds wonderful! I plan on making this as soon as possible. I’ll be back to tell you how it went. Thanks Beth, hope you enjoy it. Hi Anita. Two things come to mind…did you wait until it had chilled in the fridge overnight? And you do need a nice sharp knife for slicing. Feel free to experiment with the substitutions, but I think coconut flour is a tough one, it absorbs a ton of liquid and can throw off the balance of a recipe. Wow! 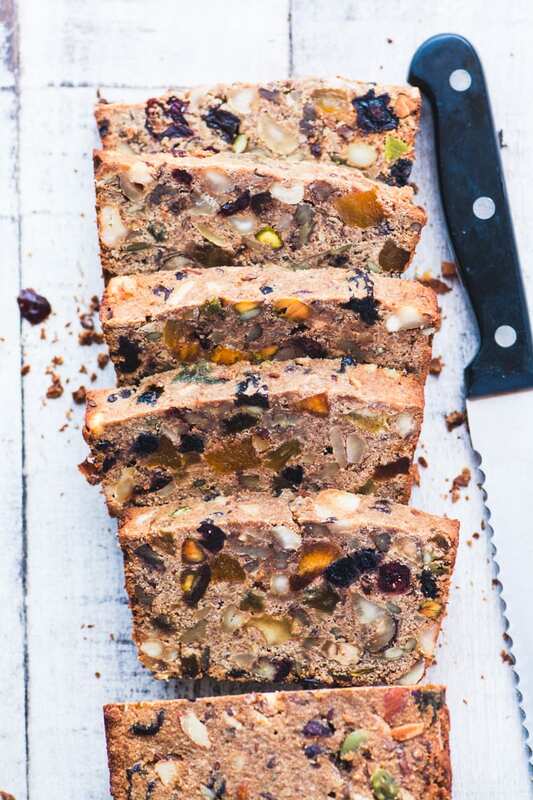 You’ve packed a lot of goodness in to this fabulous bread :) And so pretty, too! why not supply us with a method of printing off a copy of the recipe. 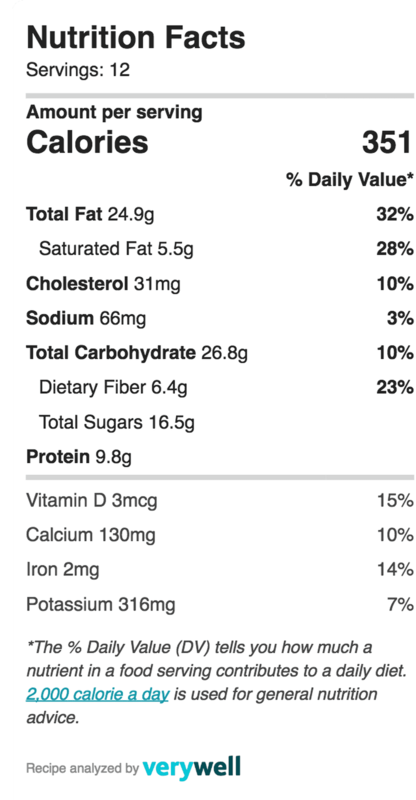 There’s a print button in the upper right hand side of the recipe John, let me know if you have trouble with it! That piece with the melting butter sold me! I’m gathering up all my dried fruits and nuts! 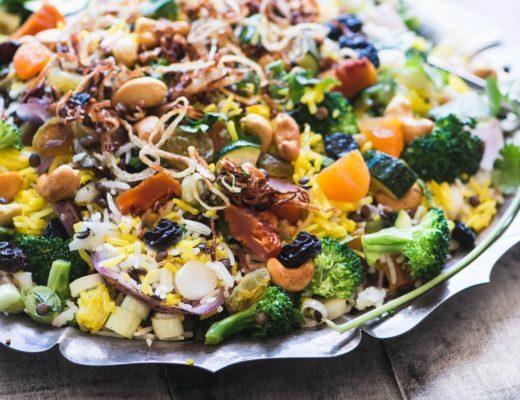 Sue, this sounds perfect for me – I often have just fruit and nuts for breakfast, and I like that this is savory rather than sweet. AND it’s pretty! This doesn’t sound like it’s right up your alley Jean! I love that Grace, what a beautiful thought! 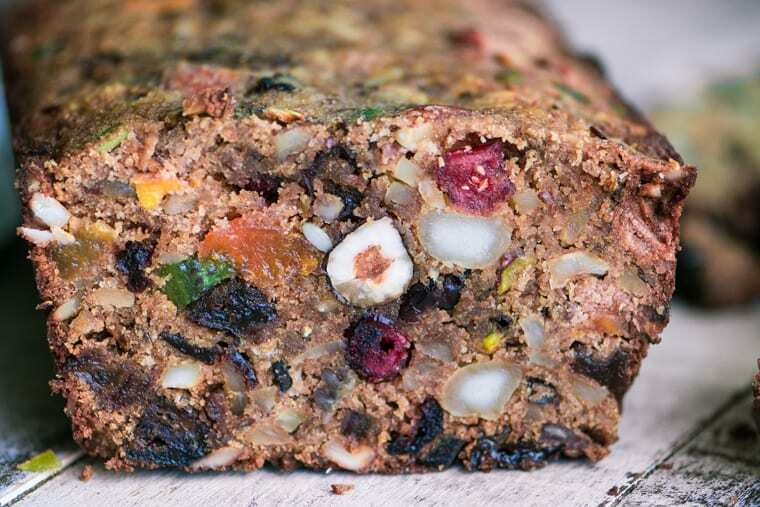 That looks like a X’mas fruit bread :-)) Beautiful! 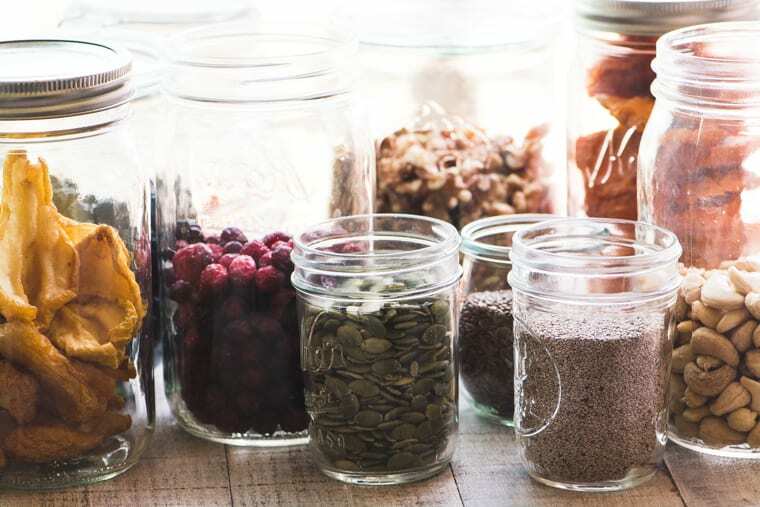 Have you been peeking in my pantry? I think I have everything except the apple butter. Can you use applesauce in place of the apple butter? This is terrific and just the recipe I need to use up those lingering bits of this and that. 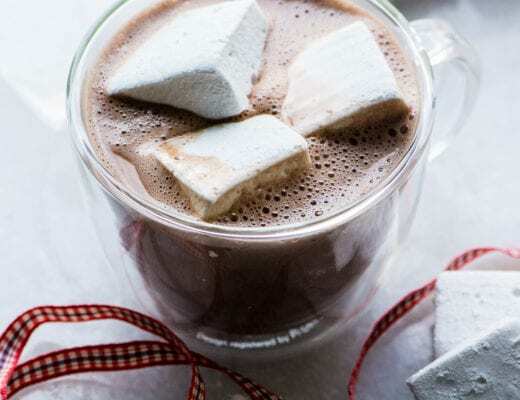 Sharing and pinning and can’t wait to try it! You could use applesauce, Tricia, but I would cook it down on the stove to reduce some of the liquid first. Wow Sue I love this bread and it’s so healthy! I plan to try your Paleo bread this week. Thanks for sharing! You’re so welcome Vicki, this bread is an adventure, for sure!